Okieladybug's Scrap N' More: Holiday Cheer...Giveaway link too! Do any of you guys remember the stamp company Inque Boutique? I loved their stamps but sadly they went out of business about two years ago. The stamps used in today's card is from that Company. I love the whimsical looking stocking! 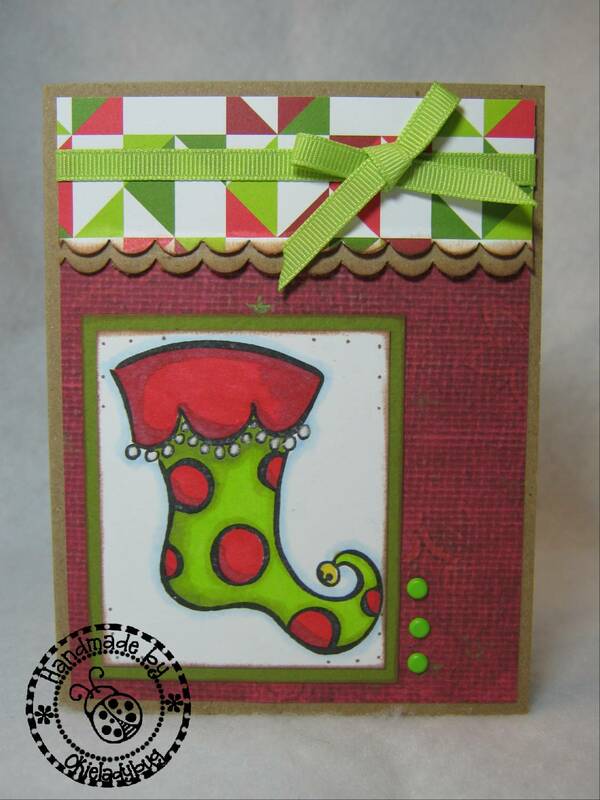 I was able to use ProMarkers to match the color of the stocking with the patterned paper at the top of the card. I used Lime Green, Pear Green, Marsh Green, Poppy and a gray of some sort to do the shading with the Poppy. I used the blender pen some and not sure I liked the look it gave but over all I still like the stocking! The patterned paper at the top was some I got at Stamp Club and is part of this month's challenge. 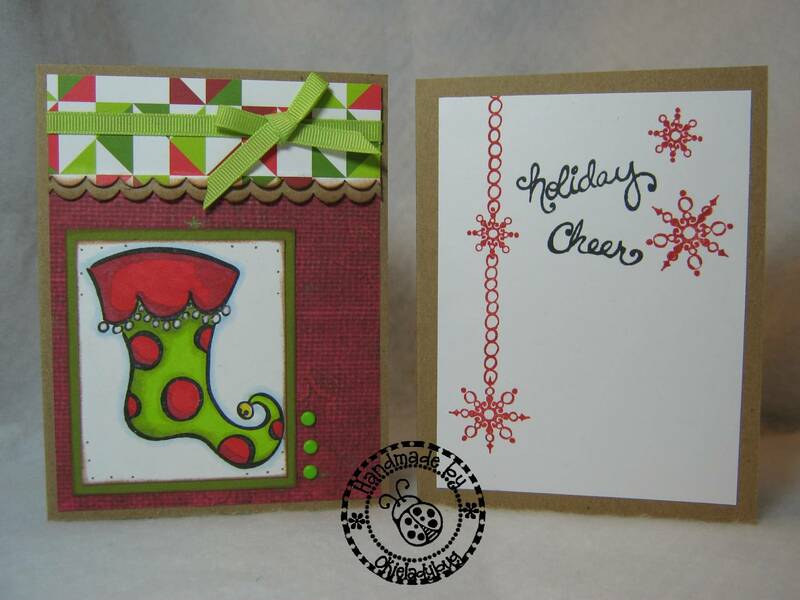 I used the Stampin Up scallop border punch on it and then also on some kraft cardstock. I curled the scallops up a little. The burgundy paper is from Fancy Pants Holly Jolly collection. I believe it came out Christmas before last. I really wanted to show you were I used flocking on the white dots but not sure it shows up well in the picture. It might show better if you click the picture and make it bigger. You can see the shading a little better in this picure. It really is easy to make something look good with the ProMarkers. I am sure if I was a better artist it would really rock but since I am not...well heck I still think it looks prety darn good! I didn't have any room for the sentiment on the front since I didn't want to block any of the whimsical stocking. The stamps used on the inside of the card were part of the set and I like how adding the extra images with the sentiment made the inside look. So what are you guys thinking about the ProMarkers? Do you think you would like some of your very own? Well guess what! Enfys from Going Buggy is having the most awesome giveway! She will be giving away a full set, yes you heard me...A FULL SET OF 148 PROMARKERS on her blog! So pop on over to GOING BUGGY and enter to win! I love that stocking, it is very cute. Thanks for sharing oh and for the heads up on the giveaway too. You are awesome. 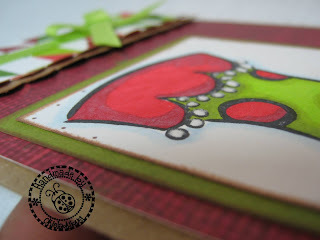 I like what you did with the challenge paper and can hardly wait to try those markers! Definitely heading over to Enfys' blog and sign up to win some! Awww.. Tooo STINKIN cute!!! Good job coloring. I not a pro with the coloring either. Another great card! I am really talking myself into those Promarkers!! Your blog and Enfys make me really want them! This is ca-ute! love that you went to the trouble to add flocking to those little pom poms on the stocking! Its so rocks! So cute. I loved that company and their stamps too. I read somewhere that someone bought the co. and then discontinued the stamps.Seems silly! Another fabulous card Okie ... those on your Christmas Card list are going to be receiving some special treasures this year! Dianne the ProMarkers are very easy to use. I watched a few video tutorials on how to use them before I used mine. The first time I used them was a week ago! that is such a cute xmas card! love the stocking! What a great card; TFS! And thanks for putting us in touch with GOING BUGGY and her wonderful giveaway. Great card...like the stamping on the inside too.